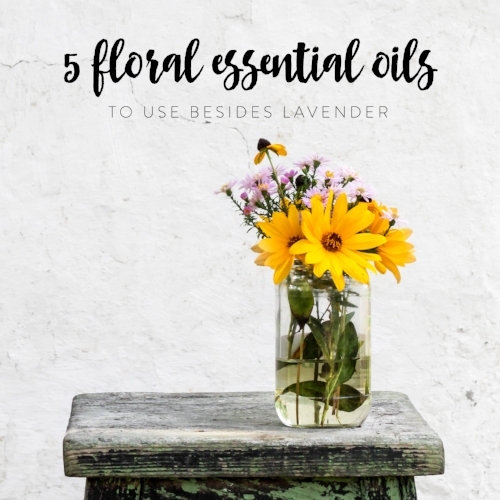 In honor of spring and the warmer temperatures here in Maryland, I wanted to do an essential oil post highlighting some awesome floral oils. Let’s be honest here - we all know about lavender and it’s versatile benefits. Everyone can use (and probably has used) lavender in some element of their life. It’s wonderfully relaxing and gentle enough to use for nearly any purpose without any adverse reaction - the swiss knife of essential oils! I mean...of course we all love lavender but I’m here to advocate for some other flowers! Let’s spread this love around folks! Not to mention - and I know this is going to be a controversial statement - I’m not a big lavender lover. It has an unfortunately strong sense memory to a time I was sick and I can’t really get past this memory of mine. I’m going to keep working on this dislike of lavender, but in the meantime let’s discover some new florals, my friends! I can’t say enough good things about this oil. It’s remarkably balancing and has the wonderful ability to balance emotions and revive weather-damaged or irritated skin. It’s also a mild diuretic, making it useful for digestion and urinary tract support. Beyond smelling good, Geranium is both calming and uplifting, so take a sniff if you’re needing a little clarity. I know I have some overwhelming moments where I could use this wonderful oil’s help. However, my favorite way to use it is in my skincare. Since I have oily skin, I need a little help balancing my oil production so my skin doesn’t end up a greasy mess within an hour of waking up. With the help of this oil, my skin stays fresh for longer. When I first used this oil, I didn’t believe the hype, but now I’m a convert and couldn’t imagine making a facial oil without it. Diffuser Blend: To lift your spirits, add 3 drops of Geranium and 3 drops of Orange into a diffuser and breathe deep. Just like the tea by the same name, Roman Chamomile essential oil is calming and soothing with anti-inflammatory properties that make it ideal for even the most sensitive of skin. Many use chamomile in a facial oil for its toning properties to keep skin clear and balanced without having to worry about a reaction from the gentle oil. In fact, it’s similar to lavender in a lot of ways so it’s perfect to diffuse at bedtime to promote restful sleep. It blends well with bergamot, clary sage, lavender, geranium, jasmine, tea tree, grapefruit and lemon to be used in roller balls or a diffuser. (I suggest tea tree + chamomile in a facial oil for glowing skin or grapefruit + chamomile for an uplifting diffuser blend). Facial Lotion: Add a few drops to your face lotion to add its calming and toning properties to your daily routine. This oil should be every girl’s best friend. With it’s exotic, floral aroma, ylang-ylang manages to be uplifting and arousing while also easing feelings of anxiety. Now that all sounds amazing but let’s get down to the real reason we should all love ylang-ylang...one word...aphrodisiac. Traditionally ylang-ylang petals were scattered on the beds of newlyweds to help dispel anxiety. With it’s relaxing properties and arousing aroma, this oil (and flower) can help release inhibitions and ease tension in bed. Now who doesn’t want that? Beyond that (like we need any more reasons) this oil helps improve the structure and appearance of tired skin and restores a youthful glow. Perfume: You can use this oil neat or you can blend 1-2 drops in a teaspoon of a base oil, such as apricot kernel, and apply it to the pulse points. Most of you should know about jasmine essential oil as its prized by perfumers and used often in many popular perfumes (Flowerbomb anyone?). The white flowers, native to India, are highly aromatic which makes them a wonderful essential oil to use aromatically. Much like ylang ylang, the warm uplifting aroma of this oil is a natural aphrodisiac for men and women and the perfect oil to use neat as a perfume next date night. Interestingly, the flowers are too delicate to be steam-distilled, so solvent extraction is used to create jasmine absolute. Another popular use is this fragrent oil blended with a carrier oil to use as a massage oil to promote skin elasticity. This cherished fragrant oil is one floral oil not to miss out on and the perfect addition to any collection. Facial Toner: Add 2-3 drops of jasmine to a teaspoon of glycerine or witch hazel and a teaspoon of water. Soak a cotton ball in the solution and apply to the skin. Most people have never heard of Manuka (I was one of those people just a few months ago) but I bet you’ve heard of Tea Tree oil, right? Well if you know or use Tea Tree then you should definitely know about Manuka as it’s widely considered a less harsh version of the popular oil used in skincare. This antiseptic oil does a wonderful job of healing cuts and abrasions while also being highly anti-fungal. Use it daily with a nourishing carrier oil base to keep your skin clear and glowing. It’s also effective for seasonal support when the seasons change and pollen is giving you a hard time (aka right now). This little super oil can help you with so many things and I suggest you try it out next time you’re thinking of using Tea Tree. Hair Rinse: Add a few drops to warm water and use as a final rinse to balance excessively dry or oily hair. If one floral isn’t enough for you then the Joy Blend by Young Living is the perfect choice for you. It consists of bergamot, ylang ylang, geranium, lemon, coriander, tangerine, jasmine, roman chamomile, palmarosa and rose blended together in perfect harmony. Use this oil to foster feelings of togetherness and romance in bedroom. It’s also the perfect addition to a bath (add a few drops to some bath salts) to help with relaxation and positivity when you’re feeling a little run down. After all, we all need a little TLC sometimes. Above all else - it smells delicious. Use this blend on your pulse points as the perfect perfume for date night or in your lotion so your legs are silky smooth and fresh as a flower! Topically: Rub 1 or 2 drops of joy over your heart to uplift your spirit. I hope that after reading this maybe I've inspired someone out there to give a new floral a chance. It is spring after all and all of these April showers are going to bring us lots of May flowers. I know I'll be adding Roman Chamomile to my own "Must Buy" list. How can I say not to all of those benefits? I hope all of you are having an amazing spring and remember to stop and smell the flowers every once in a while!